Join a group tour today! 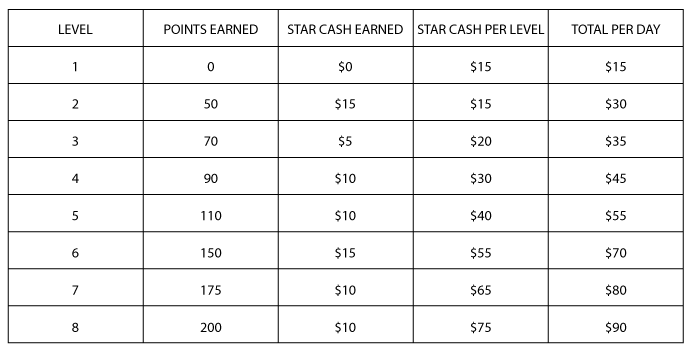 New Program Starting Saturday, February 16 – Guests have an opportunity to earn almost double the amount of Star Cash given with past programs. Plus, a greater dining offer to be used at any of our amazing food venues! Cumulative package may not exceed $15 and varies per tour/guest. Swipe your Star Rewards card at any kiosk to collect. OVERNIGHT TRIP PACKAGES (Stateside and Canadian) will receive: Maximum of 2 days only, any additional days of stay, will not receive benefits other than reduced hotel rate. Bookings prohibited on blackout dates. Weekend bookings allowed at managers discretion and will be based on group play/performance. Tour operator’s current hotel rates are based on standard rooms in the main hotel section and queen rooms in the Stardust hotel section. Current room rates are subject to change and are based on availability. Blackout dates may apply. Rates may vary per individual contract. For more information on tour pricing, please contact the Tour Department. Room rates are based on double occupancy and any additional guests are subject to a $14.95 (plus applicable taxes) charge per person, up to four people per room.